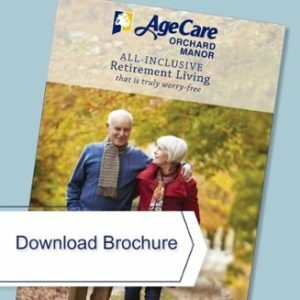 AgeCare Orchard Manor is simply the finest seniors facility in Brooks, Alberta. Here, safety and security go hand in hand with peace and comfort. Residents become friends and enjoy casual conversation in the main floor fireside lounge, with relaxing lounges also located on each floor in the four-storey residence. With a quiet tree-lined street of acreage homes on one side and a municipal park on the other, AgeCare Orchard Manor enjoys a perfect location in Brooks. Residents and guests enjoy free parking in a retirement living setting that maintains a friendly and personal charm. At AgeCare Orchard Manor, we believe in offering you as many retirement living options as possible for worry-free living in a friendly, caring, safe and secure environment. The unique design of the community lends itself to an intimate and welcoming retirement lifestyle. Personal Care Services (bathing, dressing, medicines, etc.) are available on a fee-for-service basis unless covered by the Regional Health Authority’s “Homecare Program,” but they are not included in the monthly accommodation fee.